A new book by Paul Shapiro explores the fascinating world of lab-grown meat. 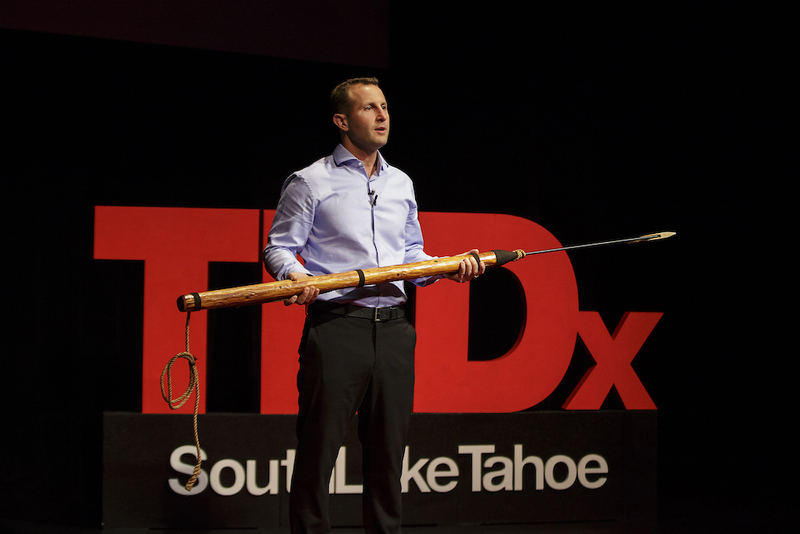 Paul Shapiro at TedX South in Lake Tahoe demonstrating with a harpoon that clean meat may do to industrial scale animal agriculture what kerosene did to whaling ships. At its most basic, the process of producing clean meat involves taking a dime-sized biopsy of myosatellite muscle cells (the kind that can regenerate) from a live animal – say a cow, pig, or chicken – then feeding those cells various nutrients until enough tissue is produced to make a burger, sausage, chicken nugget, or the like. There is also another, less publicized, method of producing animal products called acellular agriculture. This involves using genetically modified bacteria, yeast, fungi, or algae to produce the proteins and fats that make up things like leather, milk, and egg whites. The microscopic organisms are able to assemble these various constituent parts to produce dairy and other animal products that’s exactly like the stuff made the old-fashioned way. I don’t have an aversion to animal products because of their molecular structure. I have an aversion because of the way they’re produced. If you want to try clean meat you’ll have to wait at least until 2021 – the target date generally given by these companies to get their product on store shelves – but a new book on the subject by Paul Shapiro appropriately titled “Clean Meat” will give you a sneak peek of what’s to come. The book’s subtitle, “How Growing Meat Without Animals Will Revolutionize Dinner and the World,” makes clear Shapiro’s belief that this technology is a good thing. This may sound strange given Shapiro is the Vice President of Policy for the Humane Society of the United States, has been a vegan for two decades, and spent his career trying to improve the lives of farm animals, but Shapiro sees clean meat as a much less resource-intense and much more humane alternative to industrial-scale animal agriculture to satisfy the world’s growing population. This fascinating and thought-provoking book, published by Simon & Schuster, comes out on Jan. 2. 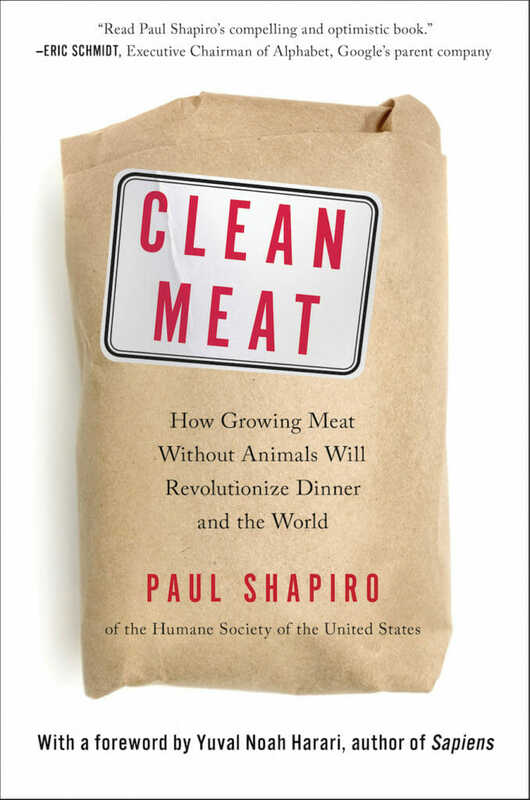 We recently caught up with Shapiro to learn more about clean meat and the author’s journey into the heart of this emerging tech sector. Modern Farmer: Did you find the people in the clean meat industry wildly optimistic in their expectations of what they’ll be able to deliver? Paul Shapiro: I think only time will answer that question. But look at the trajectory just in the last four years – In 2013, the first clean burger was debuted at a cost of over $300,000 for that one burger and today the cost of production is down by more than 80 percent. The first iPhone had a price tag of about $3 billion. Now we’re all walking around with one in our pocket. That’s not to say that it is assured. One would have thought ten or 15 years ago that today, we’d all be driving electric cars and most of us aren’t, so for every story like iPhones there’s another story of technology that didn’t take off. But I don’t think it’s unprecedented. It could happen, and it’s possible that some of the companies chronicled in the book while today are tiny startups, ten years from now are going to be multibillion dollar companies. MF: What’s the current thinking in the industry for when these types of products will hit store shelves? PS: A company called Geltor is already selling their gelatin product to the cosmetics industry, but it hasn’t been commercialized in the food industry yet. The companies that are most likely to commercialize first are not the meat companies – it’s the companies making leather, milk, and egg whites. Those companies will probably have products to market within a year. 2021 is the magic year that many of these companies assert they are going to have products on store shelves. The real key for all of these companies is to become cost competitive because that’s the only way they’re going to prevail. The key for all of these companies is to become cost competitive. That’s the only way they’re going to prevail. MF: Do you see clean meat as becoming just one more consumer choice or do you see a day when it will be the main way we get animal protein? What would be the tipping point, in your opinion? MF: You talk about what could happen to commercial farming if clean meat becomes the main way humans get animal protein in their diet. It seems to come down to either to farmers changing what they grow – in the book you give the example of tobacco farmers moving to sweet potatoes and chickpeas – or getting out of farming all together. PS: The cells still need to be fed and somebody has to grow the feed for them, but one of the main benefits of cellular agriculture is that it is much more resource friendly so you need less farming to produce the same amount of food that’s being grown today. This is part of the same trend that’s been ongoing for decades. We have come to a place with the efficiencies of modern agriculture where we can produce much more food with less land, fewer farmers, less water, and so on. When you have a technology that is so clearly superior to the existing model it’s hard to hold that back. Look at the invention of kerosene displacing whale oil or the car displacing the horse on our city streets. Clearly agriculture will still be needed, but it will be a different kind of agriculture. Scientific jobs needed in the field of clean meat will become more prominent in the world of food production. MF: For the book, you ate clean meat several times. As a vegan what was that like? Did it at all make you crave meat? PS: Honestly, no I didn’t crave meat afterward (laughs). I knew that I would not turn down the opportunity to try clean meat for a variety of reasons. I don’t have any ethical concerns about it but it was certainly a novel experience. I hadn’t eaten animal meat in more than 20 years and now I have eaten clean beef, duck, liver, and yogurt, and so I definitely had a lot of questions about what that meant to me. I don’t have an aversion to animal products because of their molecular structure, I have an aversion because of the way in which they’re produced. Yes, it is actual animal meat and defining these foods is something people will have to wrestle with. I don’t really care about the label. If eating clean meat makes me not a vegetarian, I’m not really that concerned.